Would you like to travel far to discover an amazing home? Today we go to Melbourne specifically to one of the districts of the city, Prahran, to find a home where we can see vestiges of the Victorian era. 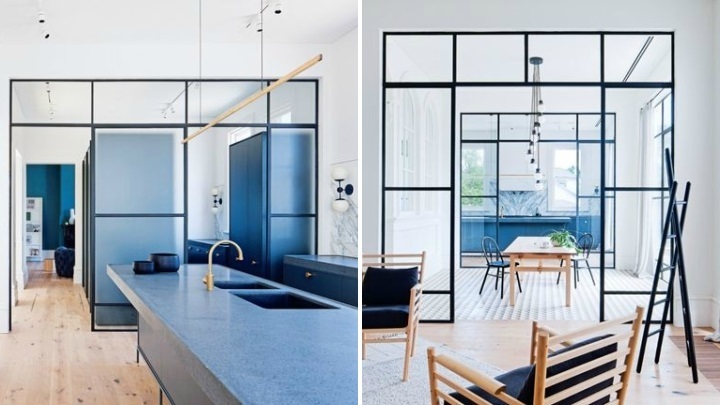 Emphasizes his blue kitchen with glass walls, although there is much to discover … We do thanks to the report published in Vogue Living Australia, we bring you up to you get deep in a house with a nice attention to detail and ornamentation. Come and sit down! One of the most visual features of this house are glass walls with steel frame separating some of the rooms. The original spaces were maintained but we wanted to solve light and acoustic problems including these glass doors that keep the areas independent but connected at the same time. From the study in charge of the remodeling of this house they indicate that each room had to have its own use and feeling. 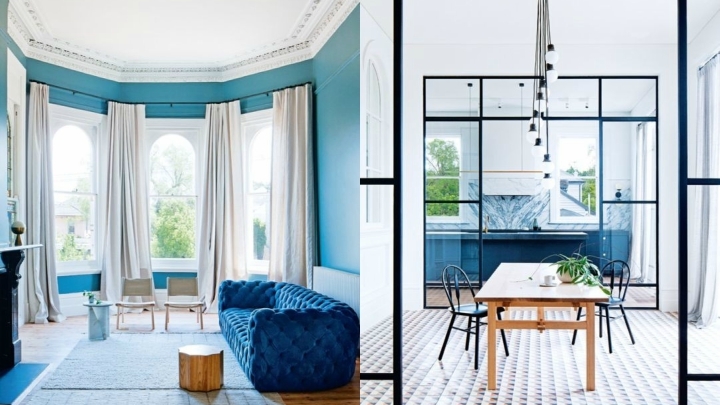 It stresses the central part of the house with the blue as the protagonist, both kitchen furniture and the walls of the room. Also chester we see in this room is this color. The kitchen and the dining room are connected through these large crystals, but perfectly differentiated also thanks to it. In the kitchen they emphasize its blue furniture and in the dining area we see only one large wooden table on which is placed a spectacular hanging lamp with several bulbs. The walls of the room, as we say, are also blue. It highlighted its large windows that reach almost to the floor, and ceiling cornices and a large central ornamentation. For this type of details to be the true protagonists, the furniture issue has been left aside, and for this reason it has been based on simple objects such as a metal shelf, two wooden chairs and a cylindrical central table, also made of wood , A sobriety that contrasts with the intensity of the chester and the grandeur of ceilings and walls. 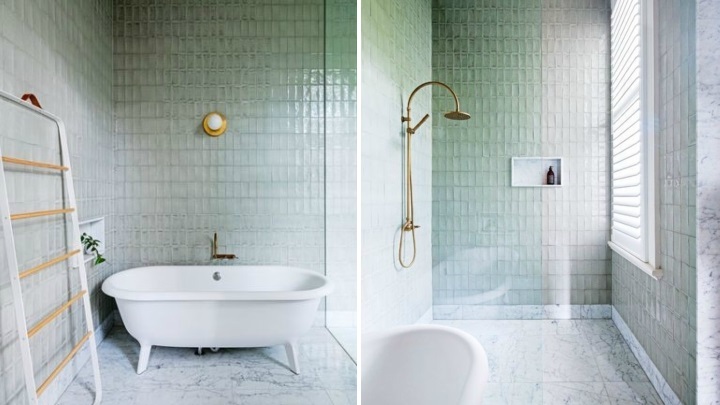 This tribute to Victorian life we continue to see in the bathroom of the master bedroom where you will find a bathtub with feet placed on a marble floor that also continues the shower area. Serene furnishings and without big brags complete this stay. In the bedroom we see also a sober and austere decor, which blends perfectly with the majesty of the large windows and the chimney. The bed is surrounded by a kind of metallic structure and furnishings complete with an armchair with quilted design and a small side table to create a comfortable corner in front of the windows.